These days spelling is a very set thing - it's either right or wrong - and that's especially true of surnames, which both bind and define us, and give us official and legal standing in the world. If our names are misspelt, it can create confusion - so we insist on correct spellings. But it wasn't always that way. Until the end of the 18th century, spelling was fluid - no set form really existed. Surnames, too, seemed to vary in spelling, depending on who was writing. It's worth remembering that literacy was nowhere near as widespread before the late 19th century, and that the whole concept for surnames as family names only began around the 14th century. One of the most confusing things you might encounter whilst researching your family tree is the surname variation. Think of your own surname. It might be very common, a Smith, Jones, or Brown, but even those sometimes have variations. The less common ones you can generally find with several different spellings. The problem is that as you go back, you'll find many of those variations on official documents too. Sometimes they're accidental, sometimes your ancestor might have wanted to change the spelling for some reason. As you delve through records it becomes imperative to keep an open mind when you're looking, and to use your imagination when it comes to spelling. Obviously, when a woman married, she generally adopted her husband's name, leaving her maiden name behind. That's probably the biggest reason behind a name change. But others have adopted stage names, for example, or noms de plumes. For yet others it's a way to evade the law, or an oppressive government or even difficult family situations. You also find name changes to be common among immigrants. Sometimes it's to assimilate or blend in, sometimes to make the name easier to pronounce and spell, but it can also be done to avoid discrimination, or even to disassociate themselves from an unpleasant past. It's difficult enough tracking someone who's changed a surname. It's worse when you have to deal with accidental changes on official documents. Often it's because clerks or clergymen, entering the names, have misheard and misspelt, either through plain error or imagination. Since there's a fair chance your ancestors - especially from the early 19th century backwards - were illiterate, they'd have no way of knowing it was wrong and asking for a correction. They may even have allowed the writer to decide on the spelling himself. 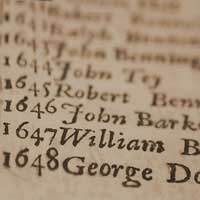 Owing to similarities between sounds, it's no uncommon to find p and b confused, or f and v, dd and th, or even z with c or s.
Whatever the reason for the name change, you should record it and its variants on your family tree. The patronymic method of surnames - where a child takes the surname based on the father's forename, - has been around on several countries for many centuries (think of Scandinavian counties as a good example). You can even find vestiges of it in Scotland - MacEwan, for instance, indicates the person is "the son of" Ewan. The problem with patronymics is that each generation acquires a new surname, so you find a whole web of names that have to be investigated. In Wales, patronymics have long been used to prove pedigrees, with "ap" meaning son of. However, as with any lineage, it can become confusing, and although they may cling to their ways privately, publicly they use fixed surnames.